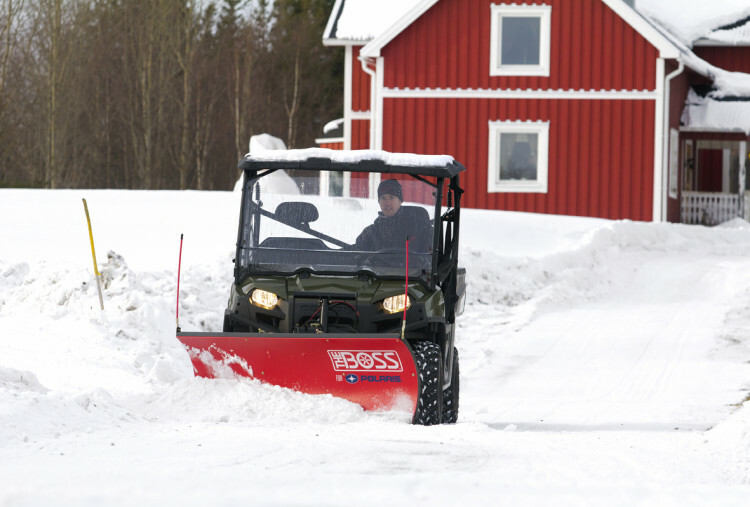 In the USA Polaris has a long - standing relationship with 'The Boss' compact winter maintenance specialists. Boss snow ploughs are designed, built and tested in Iron Mountain, Michigan, where snow, ice and harsh winter conditions are a way of life. Now Polaris owners here can benefit from The Boss technology with its introduction by Farmquip, the UK and Ireland's sole distributor. The Boss set the bar in creating ground breaking technology to make snow ploughing fast, easy and efficient. The specially engineered plough for Polaris UTV and ATV use is built to the same standards as the full-size Boss ploughs and offers a tough, contractor grade solution to handling snow removal. Featuring a high performance wear plate the plough comes with optional curb guards and snow catcher, whilst a high performance hydraulics package is standard. The hydraulics are enclosed to protect against corrosion and freezing, with a chainless lifting system to reduce snowplough bounce during transportation. A revolutionary hitch system makes the plough easy and incredibly fast to attach to a UTV. Teamed with a Polaris Ranger Diesel for example you have the traction and power to deal with the most extreme terrain and conditions, with in-cab control. But clearing snow with the plough is only part of the story. The Boss TGS 800 tailgate spreader is quickly attached to the rear of the Polaris. The rotary 'paddle action' makes the spreader a true gritter, so you can spread rock salt, grit, sand and other de-icing materials to provide traction on ice. There's an adjustable feed gate and material deflector, a high torque motor and Variable Speed Control among the many features, together with the option of the smaller TGS 600 model. The combination of Polaris and The Boss offers an all-round compact winter maintenance unit ideally suited to contractors, local authorities, small estates, hospitals, airports, in fact anywhere you're dealing with snow and ice without the need for large gritting lorries.